Mary Patricia Jordan was born in Sioux City, Iowa, lived in Knoxville, Tennessee and then St. Petersburg, Florida. She received an associate in Arts/Business Education, Associates in Science/Legal Secretary Art and Associates in Science/Legal Assistant from St. Petersburg College. 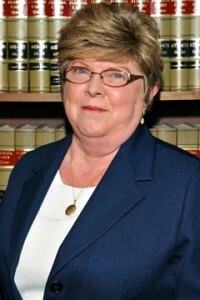 She has worked in the legal field with a variety of law firms for 41 years, and began working for Gerald R. Colen, Esq, 20 years ago in September of 1975. Her area of work includes Wills, Trust, Collections and Corporations. Outside of work she is involved in volunteer work with the literacy council tutoring adults to read; volunteer work with families in crisis; and the Sierra Club. She enjoys her children and grandchildren, hiking, fishing and vacationing in the Smokey mountains.